5 years after a heart throbbing Martian touchdown, Curiosity is climbing Vera Rubin Ridge in search of “aqueous minerals” and “clays” for clues to possible past life while capturing “truly breathtaking” vistas of humongous Mount Sharp – her primary destination – and the stark eroded rim of the Gale Crater landing zone from ever higher elevations, NASA scientists tell Universe Today in a new mission update. “Curiosity is doing well, over five years into the mission,” Michael Meyer, NASA Lead Scientist, Mars Exploration Program, NASA Headquarters told Universe Today in an interview. The car-sized rover soft landed on Mars inside Gale Crater on August 6, 2012 using the ingenious and never before tried “sky crane” system. A rare glimpse of Curiosity’s arm and turret mounted skyward pointing drill is illustrated with our lead mosaic from Sol 1833 of the robot’s life on Mars – showing a panoramic view around the alien terrain from her current location in October 2017 while actively at work analyzing soil samples. The rover has ascended more than 300 meters in elevation over the past 5 years of exploration and discovery from the crater floor to the mountain ridge. She is driving to the top of Vera Rubin Ridge at this moment and always on the lookout for research worthy targets of opportunity. Additionally, the Sol 1833 Vera Rubin Ridge mosaic, stitched by the imaging team of Ken Kremer and Marco Di Lorenzo, shows portions of the trek ahead to the priceless scientific bounty of aqueous mineral signatures detected by spectrometers years earlier from orbit by NASA’s fleet of Red Planet orbiters. “Curiosity is on Vera Rubin Ridge (aka Hematite Ridge) – it is the first aqueous mineral signature that we have seen from space, a driver for selecting Gale Crater,” NASA HQ Mars Lead Scientist Meyer elaborated. The Sol 1833 photomosaic illustrates Curiosity maneuvering her 7 foot long (2 meter) robotic arm during a period when she was processing and delivering a sample of the “Ogunquit Beach” for drop off to the inlet of the CheMin instrument earlier in October. The “Ogunquit Beach” sample is dune material that was collected at Bagnold Dune II this past spring. The sample drop is significant because the drill has not been operational for some time. “Ogunquit Beach” sediment materials were successfully delivered to the CheMin and SAM instruments over the following sols and multiple analyses are in progress. To date three CheMin integrations of “Ogunquit Beach” have been completed. Each one brings the mineralogy into sharper focus. Researchers used the Mastcam on NASA’s Curiosity Mars rover to gain this detailed view of layers in “Vera Rubin Ridge” from just below the ridge. The scene combines 70 images taken with the Mastcam’s right-eye, telephoto-lens camera, on Aug. 13, 2017. What’s the status of the rover health at 5 years, the wheels and the drill? “All the instruments are doing great and the wheels are holding up,” Meyer explained. NASA’s 1 ton Curiosity Mars Science Laboratory (MSL) rover is now closer than ever to the mineral signatures that were the key reason why Mount Sharp was chosen as the robots landing site years ago by the scientists leading the unprecedented mission. Along the way from the ‘Bradbury Landing’ zone to Mount Sharp, six wheeled Curiosity has often been climbing. To date she has gained over 313 meters (1027 feet) in elevation – from minus 4490 meters to minus 4177 meters today, Oct. 19, 2017, said Meyer. The low point was inside Yellowknife Bay at approx. minus 4521 meters. VRR alone stands about 20 stories tall and gains Curiosity approx. 65 meters (213 feet) of elevation to the top of the ridge. Overall the VRR traverse is estimated by NASA to take drives totaling more than a third of a mile (570 m). “Vera Rubin Ridge” or VRR is also called “Hematite Ridge.” It’s a narrow and winding ridge located on the northwestern flank of Mount Sharp. It was informally named earlier this year in honor of pioneering astrophysicist Vera Rubin. The intrepid robot reached the base of the ridge in early September. The ridge possesses steep cliffs exposing stratifications of large vertical sedimentary rock layers and fracture filling mineral deposits, including the iron-oxide mineral hematite, with extensive bright veins. VRR resists erosion better than the less-steep portions of the mountain below and above it, say mission scientists. What’s ahead for Curiosity in the coming weeks and months exploring VRR before moving onward and upwards to higher elevation? “Over the next several months, Curiosity will explore Vera Rubin Ridge,” Meyer replied. “The view from VRR also provides better access to what’s ahead in exploring the next aqueous mineral feature – the clay, or phyllosilicates, which can be indicators of specific environments, putting constraints on variables such as pH and temperature,” Meyer explained. The clay minerals or phyllosilicates form in more neutral water, and are thus extremely scientifically interesting since pH neutral water is more conducive to the origin and evolution of Martian microbial life forms, if they ever existed. How far away are the clays ahead and when might Curiosity reach them? The clay rich area is located beyond the ridge. Over the past few months Curiosity make rapid progress towards the hematite-bearing location of Vera Rubin Ridge after conducting in-depth exploration of the Bagnold Dunes earlier this year. “Vera Rubin Ridge is a high-standing unit that runs parallel to and along the eastern side of the Bagnold Dunes,” said Mark Salvatore, an MSL Participating Scientist and a faculty member at Northern Arizona University, in a mission update. Curiosity is using the science instruments on the mast, deck and robotic arm turret to gather detailed research measurements with the cameras and spectrometers. The pair of miniaturized chemistry lab instruments inside the belly – CheMin and SAM – are used to analyze the chemical and elemental composition of pulverized rock and soil gathered by drilling and scooping selected targets during the traverse. A key instrument is the drill which has not been operational. I asked Meyer for a drill update. “The drill feed developed problems retracting (two stabilizer prongs on either side of the drill retract, controlling the rate of drill penetration),” Meyer replied. Ascending and diligently exploring the sedimentary lower layers of Mount Sharp, which towers 3.4 miles (5.5 kilometers) into the Martian sky, is the primary destination and goal of the rover’s long term scientific expedition on the Red Planet. “Lower Mount Sharp was chosen as a destination for the Curiosity mission because the layers of the mountain offer exposures of rocks that record environmental conditions from different times in the early history of the Red Planet. Curiosity has found evidence for ancient wet environments that offered conditions favorable for microbial life, if Mars has ever hosted life,” says NASA. Stay tuned. In part 2 we’ll discuss the key findings from Curiosity’s first 5 years exploring the Red Planet. As of today, Sol 1850, Oct. 19, 2017, Curiosity has driven over 10.89 miles (17.53 kilometers) since its August 2012 landing inside Gale Crater from the landing site to the ridge, and taken over 445,000 amazing images. You can catch a glimpse of what its like to see NASA’s Curiosity Mars rover simultaneously high overhead from orbit and trundling down low across the Red Planet’s rocky surface as she climbs the breathtaking terrain of Mount Sharp – as seen in new images from NASA we have stitched together into a mosaic view showing the perspective views; see above. Earlier this month on June 5, researchers commanded NASA’s Mars Reconnaissance Orbiter (MRO) to image the car sized Curiosity rover from Mars orbit using the spacecrafts onboard High Resolution Imaging Science Experiment (HiRISE) telescopic camera during Sol 1717 of her Martian expedition – see below. HiRISE is the most powerful telescope ever sent to Mars. And as she does nearly every Sol, or Martian day, Curiosity snapped a batch of new images captured from Mars surface using her navigation camera called navcam – likewise on Sol 1717. Since NASA just released the high resolution MRO images of Curiosity from orbit, we assembled together the navcam camera raw images taken simultaneously on June 5 (Sol 1717), in order to show the actual vista seen by the six wheeled robot from a surface perspective on the same day. The lead navcam photo mosaic shows a partial rover selfie backdropped by the distant rim of Gale Crater – and was stitched together by the imaging team of Ken Kremer and Marco Di Lorenzo. Right now NASA’s Curiosity Mars Science Laboratory (MSL) rover is approaching her next science destination named “Vera Rubin Ridge” while climbing up the lower reaches of Mount Sharp, the humongous mountain that dominates the rover’s landing site inside Gale Crater. “When the MRO image was taken, Curiosity was partway between its investigation of active sand dunes lower on Mount Sharp, and “Vera Rubin Ridge,” a destination uphill where the rover team intends to examine outcrops where hematite has been identified from Mars orbit,” says NASA. The MRO image has been color enhanced and shows Curiosity as a bright blue feature. It is currently traveling on the northwestern flank of Mount Sharp. Curiosity is approximately 10 feet long and 9 feet wide (3.0 meters by 2.8 meters). See our mosaic of “Vera Rubin Ridge” and Mount Sharp below. Curiosity is making rapid progress towards the hematite-bearing location of Vera Rubin Ridge after conducting in-depth exploration of the Bagnold Dunes earlier this year. “Vera Rubin Ridge is a high-standing unit that runs parallel to and along the eastern side of the Bagnold Dunes,” says Mark Salvatore, an MSL Participating Scientist and a faculty member at Northern Arizona University, in a new mission update. Curiosity will use her cameras and spectrometers to elucidate the origin and nature of Vera Rubin Ridge and potential implications or role in past habitable environments. Ascending and diligently exploring the sedimentary lower layers of Mount Sharp, which towers 3.4 miles (5.5 kilometers) into the Martian sky, is the primary destination and goal of the rovers long term scientific expedition on the Red Planet. As of today, Sol 1733, June 21, 2017, Curiosity has driven over 10.29 miles (16.57 kilometers) since its August 2012 landing inside Gale Crater, and taken over 420,000 amazing images. Now well into her 13th year roving the Red Planet, NASA’s astoundingly resilient Opportunity rover has arrived at the precipice of “Perseverance Valley” – overlooking the upper end of an ancient fluid-carved valley on Mars “possibly water-cut” that flows down into the unimaginably vast eeriness of alien Endeavour crater. In a remarkable first time feat and treat for having ‘persevered’ so long on the inhospitably frigid Martian terrain, Opportunity has been tasked by her human handlers to drive down a Martian gully carved billions of years ago – by a fluid that might have been water – and conduct unparalleled scientific exploration, that will also extend into the interior of Endeavour Crater for the first time. No Mars rover has done that before. “This will be the first time we will acquire ground truth on a gully system that just might be formed by fluvial processes,” Ray Arvidson, Opportunity Deputy Principal Investigator of Washington University in St. Louis, told Universe Today. “Opportunity has arrived at the head of Perseverance Valley, a possible water-cut valley here at a low spot along the rim of the 22-km diameter Endeavour impact crater,” says Larry Crumpler, a rover science team member from the New Mexico Museum of Natural History & Science. “The next month or so will be an exciting time, for no rover has ever driven down a potential ancient water-cut valley before,” Crumpler gushes. “Perseverance Valley” is located along the eroded western rim of gigantic Endeavour crater – as illustrated by our exclusive photo mosaics herein created by the imaging team of Ken Kremer and Marco Di Lorenzo. Read an Italian language version of this story here by Marco Di Lorenzo. The mosaics show the “spillway” as the entry point to the ancient valley. “Investigations in the coming weeks will “endeavor” to determine whether this valley was eroded by water or some other dry process like debris flows,” explains Crumpler. The valley slices downward from the crest line through the rim from west to east at a breathtaking slope of about 15 to 17 degrees – and measures about two football fields in length! Why go and explore the gully at Perseverance Valley? “Opportunity will traverse to the head of the gully system [at Perseverance] and head downhill into one or more of the gullies to characterize the morphology and search for evidence of deposits,” Arvidson elaborated. Exploring the ancient valley is the main science destination of the current two-year extended mission (EM #10) for the teenaged robot, that officially began Oct. 1, 2016. It’s just the latest in a series of extensions going back to the end of Opportunity’s prime mission in April 2004. What are the immediate tasks ahead that Opportunity must accomplish before descending down the gully to thoroughly and efficiently investigate the research objectives? In a nutshell, extensive imaging from a local high point promontory to create a long-baseline 3 D stereo image of the valley and a “walk-about” to assess the local geology. The rover is collecting images from two widely separated points at a dip at the valley spillway to build an “extraordinarily detailed three-dimensional analysis of the terrain” called a digital elevation map. “Opportunity has been working on a panorama from the overlook for the past couple of sols. The idea is to get a good overview of the valley from a high point before driving down it,” Crumpler explains. The six wheeled rover landed on Mars on January 24, 2004 PST on the alien Martian plains at Meridiani Planum – as the second half of a stupendous sister act. Expected to last just 3 months or 90 days, Opportunity has now endured nearly 13 ½ years or an unfathomable 53 times beyond the “warrantied” design lifetime. Her twin sister Spirit, had successfully touched down 3 weeks earlier on January 3, 2004 inside 100-mile-wide Gusev crater and survived more than six years. Opportunity has been exploring Endeavour almost six years – since arriving at the humongous crater in 2011. Endeavour crater was formed when it was carved out of the Red Planet by a huge meteor impact billions of years ago. “Endeavour crater dates from the earliest Martian geologic history, a time when water was abundant and erosion was relatively rapid and somewhat Earth-like,” explains Crumpler. Exactly what the geologic process was that carved Perseverance Valley into the rim of Endeavour Crater billions of years ago has not yet been determined, but there are a wide range of options researchers are considering. “Among the possibilities: It might have been flowing water, or might have been a debris flow in which a small amount of water lubricated a turbulent mix of mud and boulders, or might have been an even drier process, such as wind erosion,” say NASA scientists. Extensive imaging with the mast mounted pancam and navcam cameras is currently in progress. “The long-baseline stereo imaging will be used to generate a digital elevation map that will help the team carefully evaluate possible driving routes down the valley before starting the descent,” said Opportunity Project Manager John Callas of JPL, in a statement. The team is also dealing with a new wheel issue and evaluating fixes. The left-front wheel is stuck due to an actuator stall. “The rover experienced a left-front wheel steering actuator stall on Sol 4750 (June 4, 2017) leaving the wheel ‘toed-out’ by 33 degrees,” the team reported in a new update. Thus the extensive Pancam panorama is humorously being called the “Sprained Ankle Panorama.” Selected high-value targets of the surrounding area will be imaged with the full 13-filter Pancam suite. After reaching the bottom of Perseverance Valley, Opportunity will explore the craters interior for the first time during the mission. “Once down at the end of the valley, Opportunity will be directed to explore the crater fill on a drive south at the foot of the crater walls,” states Crumpler. As of today, June 17, 2017, long lived Opportunity has survived over 4763 Sols (or Martian days) roving the harsh environment of the Red Planet. Opportunity has taken over 220,800 images and traversed over 27.87 miles (44.86 kilometers) – more than a marathon. See our updated route map below. It shows the context of the rovers over 13 year long traverse spanning more than the 26 mile distance of a Marathon runners race. The rover surpassed the 27 mile mark milestone on November 6, 2016 (Sol 4546). As of Sol 4759 (June 13, 2017) the power output from solar array energy production is currently 343 watt-hours with an atmospheric opacity (Tau) of 0.842 and a solar array dust factor of 0.529, before heading into another southern hemisphere Martian winter later in 2017. It will count as Opportunity’s 8th winter on Mars. “The science team is really jazzed at starting to see this area up close and looking for clues to help us distinguish among multiple hypotheses about how the valley formed,” said Opportunity Project Scientist Matt Golombek of NASA’s Jet Propulsion Laboratory, Pasadena, California. Meanwhile Opportunity’s younger sister rover Curiosity traverses and drills into the lower sedimentary layers at the base of Mount Sharp. And NASA continues building the next two robotic missions due to touch down in 2018 and 2020. NASA as well is focusing its human spaceflight effort on sending humans on a ‘Journey to Mars’ in the 2030s with the Space Launch System (SLS) mega rocket and Orion deep space crew capsule. Tis a season of incredible wind driven activity on Mars like few before witnessed by our human emissaries ! Its summer on the Red Planet and the talented scientists directing NASA’s Curiosity rover have targeted the robots cameras so proficiently that they have efficiently spotted a multitude of ‘Dust Devils’ racing across across the dunes fields of Gale Crater– see below. The ‘Dust Devils’ are actually mini tornadoes like those seen on Earth. But in this case they are dancing delightfully in the Bagnold Dune fields on Mars, as Curiosity surpassed 1625 Sols, or Martian days of exciting exploration and spectacular science and discovery. Furthermore they whip up the dust more easily in the lower gravity field on Mars compared to Earth. Mars gravity is about one third of Earth’s. Right now it’s summer inside the rovers southern hemisphere landing site at Gale Crater. And summer is the windiest time of the Martian year. “Dust devils are whirlwinds that result from sunshine warming the ground, prompting convective rising of air that has gained heat from the ground. Observations of Martian dust devils provide information about wind directions and interaction between the surface and the atmosphere,” as described by researchers. So now is the best time to observe and photograph the dusty whirlwinds in action as they flitter amazingly across the craters surface carrying dust in their wake. Therefore researchers are advantageously able to utilize Curiosity in a new research campaign that “focuses on modern wind activity in Gale” on the lower slope of Mount Sharp — a layered mountain inside the crater. Indeed, this past month Curiosity began her second sand dune campaign focusing on investigating active dunes on the mountain’s northwestern flank that are ribbon-shaped linear dunes. “In these linear dunes, the sand is transported along the ribbon pathway, while the ribbon can oscillate back and forth, side to side,” said Nathan Bridges, a Curiosity science team member at the Johns Hopkins University Applied Physics Laboratory in Laurel, Maryland, in a statement. These new dunes are different from those investigated during the first dune campaign back in late 2015 and early 2016 that examined crescent-shaped dunes, including Namib Dune in our mosaic below. The initial dune campaign actually involved the first ever up-close study of active sand dunes anywhere other than Earth, as I reported at the time. By snapping a series of targeted images pointed in just the right direction using the rovers mast mounted navigation cameras, or navcams, the researchers have composed a series of ‘Dust Devil’ movies – gathered together here for your enjoyment. “We’re keeping Curiosity busy in an area with lots of sand at a season when there’s plenty of wind blowing it around,” said Curiosity Project Scientist Ashwin Vasavada of NASA’s Jet Propulsion Laboratory, Pasadena, California. The movies amply demonstrate that Mars is indeed an active world and winds are by far the dominant force shaping and eroding the Red Planets alien terrain – despite the thin atmosphere less than 1 percent of Earth’s. Indeed scientists believe that wind erosion over billions of years of time is what caused the formation of Mount Sharp at the center of Gale Crater by removing vast amounts of dust and sedimentary material — about 15,000 cubic miles (64,000 cubic kilometers) — as Mars evolved from a wet world to the dry, desiccated planet we see today. Winds gradually carved away so much sediment and dirt that we are left with the magnificent mountain in view today. The whirlwinds called “dust devils” have been recorded moving across terrain in the crater, in sequences of afternoon images taken several seconds apart. The contrast has been enhanced to better show the dust devils in action. These dune investigations have to be done now, because the six wheeled robot will soon ascend Mount Sharp, the humongous layered mountain at the center of Gale Crater. “Before Curiosity heads farther up Mount Sharp, the mission will assess movement of sand particles at the linear dunes, examine ripple shapes on the surface of the dunes, and determine the composition mixture of the dune material,” researchers said. Curiosity is also using the science instruments on the robotic arm turret to gather detailed research measurements with the cameras and spectrometers. As of today, Sol 1625, March 2, 2017, Curiosity has driven over 9.70 miles (15.61 kilometers) since its August 2012 landing inside Gale Crater, and taken over 391,000 amazing images. We all love the ‘selfies’ the Curiosity rover takes of itself sitting on Mars. We love them because it’s so amazing to see a human-made object on another world, and these images give us hope that one day we might have pictures of ourselves standing on the surface of the Red Planet. But wouldn’t it be great if we see Curiosity ‘in action’ on Mars, and be like a fly on a rock, watching the rover roll past us? Thanks to creative artist Seán Doran, we can do just that. Take a look at this absolutely amazing video Seán created, using real images of the Mars landscape from Curiosity and the HiRISE camera on the Mars Reconnaissance Orbiter, with a GCI Curiosity roving around. Please note that Curiosity doesn’t actually move this fast, as in the video it is going about 8 kph, whereas in reality, the rover travels at a top speed of about .16 kph. But still, this is just fantastic! Seán has provided a glimpse at how to do this, and says there are two ways of achieving these results. Create a photomosaic of a scene where tracks are present. 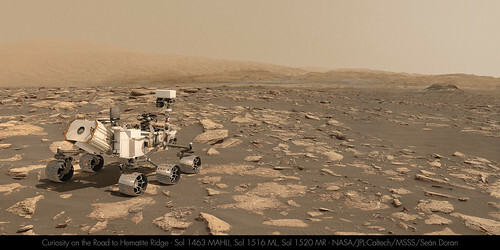 Render a 3D model of Curiosity to the same relative angle of the tracks and composite this into the image. Or, there’s the hard way, a process which allows Seán to ‘drive’ Curiosity across the field of view of any photomosaic the rover has taken, whether there are tracks or not. This process involves using the what are called Digital Terrain Model (DTM) data from HiRISE, which provide elevation and terrain information (more info about DTMs in our recent article here) and by mapping with a virtual camera. You can see Doran’s work on this model in Sketchfab, which he has been putting together for several months. But to make everything realistic, your virtual rover needs to be the right size and even the right weight. 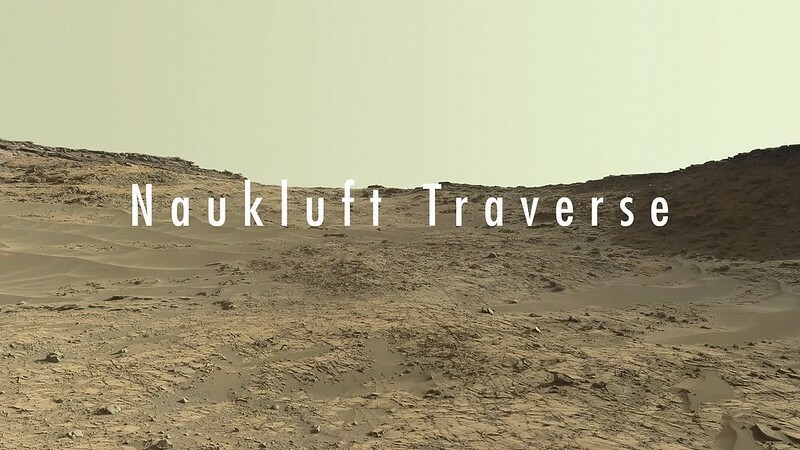 A true-to-size CGI rover inserted in the view of the Naukluft Plateau. Credit: NASA/JPL/University of Arizona/Seán Doran. Then he ‘builds’ the route and terrain to make it even more realistic. Simulated terrain and rover on the Naukluft Plateau. Credit: Seán Doran. Then Seán builds a ‘car rig’ for Curiosity and drives her across the scene, in line with the actual route taken. Seán says good choices for doing this are using MadCar and DriveMaster for 3DS Max. Simulated Curiosity rover on the Martian terrain, created using MadCar & DriveMaster for 3DS Max. Credit: Seán Doran. Full extent of Naukluft Plateau built with HiRISE elevation and texture data, with the route superimposed. Credit: NASA/JPL/University of Arizona/Seán Doran. Simulated rover and terrain with position of the Sun. Credit: Seán Doran. Then, everything is brought together in Adobe After Effects, where further image processing is used to blend both render elements together. Simulated rover inserted in the scene with Adobe After Effects. Credit: Seán Doran. We thank Seán Doran not only for completing this intricate process we can all enjoy, but for sharing the details! You can see many more images of Curiosity from Doran’s Flickr account, and his Sketchfab account has a lot of VR-ready content to explore. Doran’s Gigapan account has extremely high resolution images of Gale Crater built using HiRISE data. Opportunity Blazes Through 4500 Sunsets on Mars and Gullies are Yet to Come! The longest living Martian rover ever – Opportunity – has just surpassed another unfathomable milestone – 4500 Sols (or days) exploring the Red Planet !! That’s 50 times beyond her “warrantied” life expectancy of merely 90 Sols. And as we are fond of reporting – the best is yet to come. After experiencing 4500 Martian sunsets, Opportunity has been granted another mission extension and she is being targeted to drive to an ancient gully where life giving liquid water almost certainly once flowed on our solar systems most Earth-like planet. See Opportunity’s current location around ‘Spirit Mound” – illustrated in our new photo mosaic panoramas above and below. After a scorching ‘6 minutes of Terror’ plummet through the thin Martian atmosphere, Opportunity bounced to an airbag cushioned landing on the plains of Meridiani Planum on January 24, 2004 – nearly 13 years ago! Opportunity was launched on a Delta II rocket from Cape Canaveral Air Force Station in Florida on July 7, 2003. “We have now exceeded the prime-mission duration by a factor of 50,” noted Opportunity Project Manager John Callas of NASA’s Jet Propulsion Laboratory, Pasadena, California. And at this moment, as Opportunity reached and surpassed the 4500 Sol milestone, she is investing an majestic spot dubbed “Spirit Mound” – and named after her twin sister “Spirit” – who landed 3 weeks earlier! This scene from the panoramic camera (Pancam) on NASA’s Mars Exploration Rover Opportunity shows “Spirit Mound” overlooking the floor of Endeavour Crater. The mound stands near the eastern end of “Bitterroot Valley” on the western rim of the crater, and this view faces eastward. The component images for this mosaic were taken on Sept. 21, 2016, during the 4,501st Martian day, or sol, of Opportunity’s work on Mars. Credit: NASA/JPL-Caltech/Cornell/Arizona State Univ. Endeavour crater spans some 22 kilometers (14 miles) in diameter. Opportunity has been exploring Endeavour since arriving at the humongous crater in 2011. Endeavour crater was formed when it was carved out of the Red Planet by a huge meteor impact billions of years ago. But now for the first time she will explore the craters interior, after spending 5 years investigating the exterior and climbing to a summit on the rim and spending several year exploring the top before finally descending down the Marathon Valley feature to investigate clay minerals formed in water. “The longest-active rover on Mars also will, for the first time, visit the interior of the crater it has worked beside for the last five years,” said NASA officials. Marathon Valley measures about 300 yards or meters long. It cuts downhill through the west rim of Endeavour crater from west to east – the same direction in which Opportunity drove downhill from a mountain summit area atop the crater rim. See our route map below showing the context of the rovers over dozen year long traverse spanning more than the 26 mile distance of a Marathon runners race. Opportunity is now being targeted to explore a gully carved out by water. “We are confident this is a fluid-carved gully, and that water was involved,” said Opportunity Principal Investigator Steve Squyres of Cornell University, Ithaca, New York. Furthermore, in what’s a very exciting announcement the team “intends to drive Opportunity down the full length of the gully, onto the crater floor” – if the rover continues to function well during the two year extended mission which will have to include enduring her 8th frigid Martian winter in 2017. And as is always the case, scientists will compare these interior crater rocks to those on the exterior for clues into the evolution, environmental and climatic history of Mars over billions of years. As of today, Sol 4522, Oct 12, 2016, Opportunity has taken over 214,400 images and traversed over 26.99 miles (43.44 kilometers) – more than a marathon. The power output from solar array energy production is currently 472 watt-hours, before heading into another southern hemisphere Martian winter in 2017. Meanwhile Opportunity’s younger sister rover Curiosity traverses and drills into the basal layers at the base of Mount Sharp. Our beyond magnificent Curiosity rover has just finished her latest Red Planet drilling campaign – at the rock target called “Quela” – into the simply unfathomable alien landscapes she is currently exploring at the “Murray Buttes” region of lower Mount Sharp. And it’s all in a Sols (or Martian Day’s) work for our intrepid Curiosity! “These images are literally out of this world.. I don’t think I have seen anything like them on Earth!” Jim Green, Planetary Sciences Director at NASA Headquarters, Washington, D.C., explained to Universe Today. The “Murray Buttes” region is just chock full of the most stunning panoramic vistas that NASA’s Curiosity Mars Science Laboratory rover has come upon to date. Observe and enjoy them in our exclusive new photo mosaics above and below. “We always try to find some sort of Earth analog but these make exploring another world all worth it!” Green gushed in glee. They fill the latest incredible chapter in her thus far four year long quest to trek many miles (km) from the Bradbury landing site across the floor of Gale Crater to reach the base region of humongous Mount Sharp. And these adventures are just a prelude to the even more glorious vistas she’ll investigate from now on – as she climbs higher and higher on an expedition to thoroughly examine the mountains sedimentary layers and unravel billions and billions of years of Mars geologic and climatic history. Drilling holes into Mars during the Red Planet trek and carefully analyzing the pulverized samples with the rovers pair of miniaturized chemistry laboratories (SAM and CheMin) is the route to the answer of how and why Mars changed from a warmer and wetter planet in the ancient past to the cold, dry and desolate world we see today. The rock target named “Quela” is located at the base of one of the buttes dubbed “Murray Butte number 12,” according to the latest mission update from Prof. John Bridges, a Curiosity rover science team member from the University of Leicester, England. It took two tries to get the drilling done due to a technical issue, but all went well in the end and it was well worth the effort at a place never before explored by an emissary from Earth. The full depth drilling was completed on Sol 1464, Sept. 18, 2016 using the percussion drill at the terminus of the outstretched 7-foot-long (2-meter-long) robotic arm – as confirmed by imaging and further illustrated in our navcam camera photo mosaic. And that immediately provided valuable insight into climate change on Mars. “You can see how red and oxidised the tailings are, suggesting changing environmental conditions as we progress through the Mt. Sharp foothills,” Bridges explained in the mission update. Curiosity bore holes measure approximately 0.63 inch (1.6 centimeters) in diameter and 2.6 inches (6.5 centimeters) deep. To give you the context of the Murray Buttes region and the drilling at Quela, the image processing team of Ken Kremer and Marco Di Lorenzo has begun stitching together wide angle mosaic landscape views and up close views of the drilling using raw images from the variety of cameras at Curiosity’s disposal. The next steps after boring into Quela were to “sieve the new sample, dump the unsieved fraction, and drop some of the sieved sample into CheMin,” says Ken Herkenhoff, Research Geologist at the USGS Astrogeology Science Center and an MSL science team member, in a mission update. The rover had approached the butte from the south side several sols earlier to get in place, plan for the drilling, take imagery to document stratigraphy and make compositional observations with the ChemCam laser instrument. Sol after Sol the daily imagery transmitted back to eager researchers on Earth reveal spectacularly layered Martian rock formations in such exquisite detail that they look and feel just like America’s desert Southwest landscapes. “These are the landforms that dominate the landscape at this point in the traverse – The Murray Buttes,” says Bridges. What are the Murray Buttes? The imagery of the Murray Buttes and mesas show them to be eroded remnants of ancient sandstone that originated when winds deposited sand after lower Mount Sharp had formed. Scanning around the Murray Buttes mosaics one sees finely layered rocks, sloping hillsides, the distant rim of Gale Crater barely visible through the dusty haze, dramatic hillside outcrops with sandstone layers exhibiting cross-bedding. The presence of “cross-bedding” indicates that the sandstone was deposited by wind as migrating sand dunes, says the team. Curiosity spent some six weeks or so traversing and exploring the Murray Buttes. So after collecting all that great drilling data at Quela, the team is ready for even more spectacular new adventures! “While the Murray Buttes were spectacular and interesting, it’s good to be back on the road again, as there is much more of Mt. Sharp to explore!” concludes Herkenhoff. And the team is already commanding Curiosity to drive ahead in hot pursuit of the next drill target! Three years ago, the team informally named the Murray Buttes site to honor Caltech planetary scientist Bruce Murray (1931-2013), a former director of NASA’s Jet Propulsion Laboratory, Pasadena, California. JPL manages the Curiosity mission for NASA. As of today, Sol 1470, September 24, 2016, Curiosity has driven over 7.9 miles (12.7 kilometers) since its August 2012 landing inside Gale Crater, and taken over 355,000 amazing images. The most stunning panoramic vistas likely ever snapped by NASA’s Curiosity rover reveal spectacularly layered Martian rock formations in such exquisite detail that they look and feel just like America’s desert Southwest landscapes. They were just captured a week ago and look like a scene straight out of the hugely popular science fiction movie ‘The Martian’ – only they are real !! Indeed several magnificent panoramas were taken by Curiosity in just the past week and you can see our newly stitched mosaic versions of several – above and below. The rock formations lie in the “Murray Buttes” region of lower Mount Sharp where Curiosity has been exploring for roughly the past month. She just finished a campaign of detailed science observations and is set to bore a new sampling hole into the Red Planet, as you read this. While scouting around the “Murray Buttes,” the SUV sized rover captured thousands of color and black and white raw images to document the geology of this thus far most unrivaled spot on the Red Planet ever visited by an emissary from Earth. So the image processing team of Ken Kremer and Marco Di Lorenzo has begun stitching together wide angle mosaic views starting with images gathered by the high resolution mast mounted Mastcam right color camera, or M-100, on Sept, 8, 2016, or Sol 1454 of the robots operations on Mars. The mosaics give context and show us exactly what the incredible alien surroundings look like where the six wheeled rover is exploring today. Scanning around the Murray Buttes mosaics one sees finely layered rocks, sloping hillsides, the distant rim of Gale Crater barely visible through the dusty haze, dramatic hillside outcrops with sandstone layers exhibiting cross-bedding. The presence of “cross-bedding” indicates that the sandstone was deposited by wind as migrating sand dunes, says the team. But there is no time to rest as she was commanded to head further south to the last of these Murray Buttes. And right now the team is implementing a plan for Curiosity to drill a new hole in Mars today – at a target named “Quela” at the base of the last of the buttes. The rover approached the butte from the south side a few days ago to get in place and plan for the drilling, take imagery to document stratigraphy and make compositional observations with the ChemCam laser instrument. “It’s always an exciting day on Mars when you prepare to drill another sample – an engineering feat that we’ve become so accustomed to that I sometimes forget how impressive this really is!” wrote Lauren Edgar, in a mission update today. Edgar is a Research Geologist at the USGS Astrogeology Science Center and a member of the MSL science team. Curiosity will then continue further south to begin exploring higher and higher sedimentary layers up Mount Sharp. The “Murray Buttes” are the entry way along Curiosity’s planned route up lower Mount Sharp. Meanwhile Curiosity is still conducting science observations of the last drill sample gathered from the “Marimba” target in August focusing on MAHLI and APXS examination of the dump pile leftovers from the sieved sample. She just completed chemical analysis of the sieved sample using the miniaturized SAM and CheMin internal chemistry laboratories. It’s interesting to note that although the buttes are striking, their height also presents communications issues by blocking radio signals with NASA’s orbiting relay satellites. NASA’s Opportunity rover faced the same issues earlier this year while exploring inside the high walled Marathon Valley along Ecdeavour Crater. “While the buttes are beautiful, they pose a challenge to communications, because they are partially occluding communications between the rover and the satellites we use to relay data (MRO and ODY), so sometimes the data volume that we can relay is pretty low” wrote Edgar. As of today, Sol 1461, September 15, 2016, Curiosity has driven over 7.9 miles (12.7 kilometers) since its August 2012 landing inside Gale Crater, and taken over 353,000 amazing images. Top NASA managers have formally approved the launch of the agency’s InSight Lander to the Red Planet in the spring of 2018 following a postponement from this spring due to the discovery of a vacuum leak in a prime science instrument supplied by France. The InSight missions goal is to accomplish an unprecedented study of the deep interior of the most Earth-like planet in our solar system. NASA is now targeting a new launch window that begins May 5, 2018, for the Interior Exploration using Seismic Investigations, Geodesy and Heat Transport (InSight). mission aimed at studying the deep interior of Mars. The Mars landing is now scheduled for Nov. 26, 2018. InSight had originally been slated for blastoff on March 4, 2016 atop a United Launch Alliance (ULA) Atlas V rocket from Vandenberg Air Force Base, California. But the finding of a vacuum leak in its prime science instrument, the French-built Seismic Experiment for Interior Structure (SEIS), in December 2015 forced an unavoidable two year launch postponement. Because of the immutable laws of orbital mechanics, launch opportunities to the Red Planet only occur approximately every 26 months. The revised launch date was approved by the agency’s Science Mission Directorate. “Our robotic scientific explorers such as InSight are paving the way toward an ambitious journey to send humans to the Red Planet,” said Geoff Yoder, acting associate administrator for NASA’s Science Mission Directorate, in Washington, in a statement. NASA’s InSight Mars lander spacecraft in a Lockheed Martin clean room near Denver. As part of a series of deployment tests, the spacecraft was commanded to deploy its solar arrays in the clean room to test and verify the exact process that it will use on the surface of Mars. Since InSight would not have been able to carry out and fulfill its intended research objectives because of the vacuum leak in its defective SEIS seismometer instrument, NASA managers had no choice but to scrub this year’s launch. For a time its outlook for a future revival seemed potentially uncertain in light of today’s constrained budget environment. The leak, if left uncorrected, would have rendered the flawed probe useless to carry out the unprecedented scientific research foreseen to measure the planets seismic activity and sense for “Marsquakes” to determine the nature of the Red Planet’s deep interior. “The SEIS instrument — designed to measure ground movements as small as half the radius of a hydrogen atom — requires a perfect vacuum seal around its three main sensors in order to withstand harsh conditions on the Red Planet,” according to NASA. The SEIS seismometer instrument was provided by the Centre National d’Études Spatiales (CNES) – the French national space agency equivalent to NASA. SEIS is one of the two primary science instruments aboard InSight. The other instrument measuring heat flow from the Martian interior is provided by the German Aerospace Center (DLR) and is named Heat Flow and Physical Properties Package (HP3). The HP3 instrument checked out perfectly. NASA Jet Propulsion Laboratory (JPL) was assigned lead responsibility for the “replanned” mission and insuring that the SEIS instrument operates properly with no leaks. “We’ve concluded that a replanned InSight mission for launch in 2018 is the best approach to fulfill these long-sought, high-priority science objectives,” said Jim Green, director of NASA’s Planetary Science Division. The cost of the two-year delay and instrument redesign amounts to $153.8 million, on top of the original budget for InSight of $675 million. Lockheed Martin is the prime contractor for InSight and placed the spacecraft in storage while SEIS is fixed. InSight is funded by NASA’s Discovery Program of low cost, focused science missions along with the science instrument funding contributions from France and Germany. Meanwhile, NASA is preparing to launch its big planetary mission of 2018 on Thursday of this week ! – the OSIRIS-REx asteroid sample return probe blasts off on an Atlas V on Sept 8. Watch for Ken’s continuing OSIRIS-REx mission and launch reporting from on site at the Kennedy Space Center and Cape Canaveral Air Force Station, FL. Four years after a nail biting touchdown on the Red Planet, NASA’s SUV-sized Curiosity rover is at last nearing the long strived for “Murray Buttes” formation on the lower reaches of Mount Sharp. This is a key milestone for the Curiosity mission because the “Murray Buttes” are the entry way along Curiosity’s planned route up lower Mount Sharp. The area features eroded mesas and buttes that are reminiscent of the U.S. Southwest. So the team directed the rover to capture a 360-degree color panorama using the robots mast mounted Mastcam camera earlier this month on Aug. 5. The full panorama shown above combines more than 130 images taken by Curiosity on Aug. 5, 2016, during the afternoon of Sol 1421 by the Mastcam’s left-eye camera. 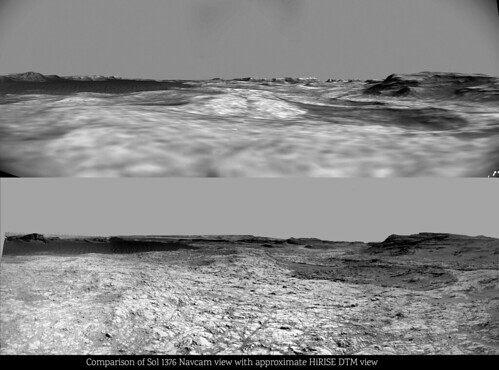 In particular note the dark, flat-topped mesa seen to the left of the rover’s arm. It stands about 50 feet (about 15 meters) high and, near the top, about 200 feet (about 60 meters) wide. Coincidentally, Aug. 5 also marks the fourth anniversary of the six wheeled rovers landing on the Red Planet via the unprecedented Sky Crane maneuver. You can explore this spectacular Mars panorama in great detail via this specially produced 360-degree panorama from JPL. Simply move the magnificent view back and forth and up and down and all around with your mouse or mobile device. Video Caption: This 360-degree panorama was acquired on Aug. 5, 2016, by the Mastcam on NASA’s Curiosity Mars rover as the rover neared features called “Murray Buttes” on lower Mount Sharp. The dark, flat-topped mesa seen to the left of the rover’s arm is about 50 feet (about 15 meters) high and, near the top, about 200 feet (about 60 meters) wide. “The buttes and mesas are capped with rock that is relatively resistant to wind erosion. This helps preserve these monumental remnants of a layer that formerly more fully covered the underlying layer that the rover is now driving on,” say rover scientists. Three years ago, the team informally named the site to honor Caltech planetary scientist Bruce Murray (1931-2013), a former director of NASA’s Jet Propulsion Laboratory, Pasadena, California. JPL manages the Curiosity mission for NASA. As of today, Sol 1447, August 31, 2016, Curiosity has driven over 7.9 miles (12.7 kilometers) since its August 2012 landing, and taken over 348,500 amazing images.